I took a class on Jesus in Film and Pop Culture in college, and in that course we looked at how Jesus is portrayed in various cartoons, paintings, songs, and films. It was a fantastic course (at a fantastic Quaker-oriented college: shout-out to Guilford College). So I have seen a lot of Jesus cartoons and memes, but I have to say that this series is my favorite. I have a few of them hanging on the wall in my office, and they are not only fun, but they really get down to the heart of Jesus’ teachings. I think we often get too caught up in talking about the nit-picky details about the idea of Jesus that we forget what Jesus really taught. In fact, our skirmishes over the details of the idea of Jesus often cause us to break some of Jesus’ primary teachings. We forget to be nice to each other! 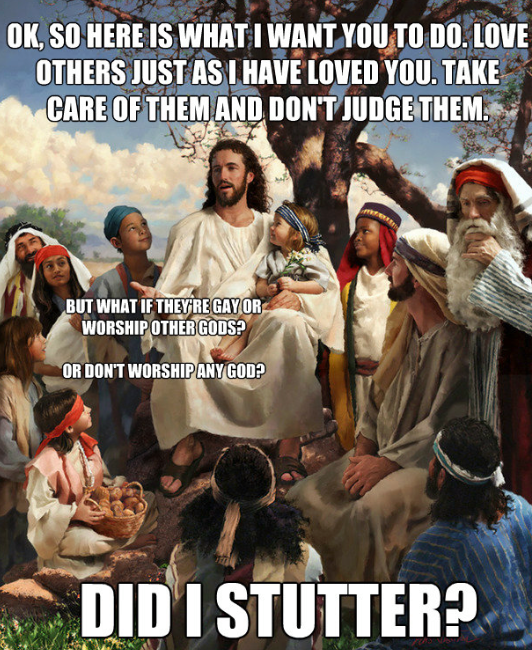 We forget that Jesus taught acceptance and taking care of one another and not judging one another. I can only imagine Jesus as the silent listener in the room when we get caught up in being nasty to one another over theology, rolling his eyes and shouting “Did I stutter?” at anyone who will still pay attention to him. A major part of peace starts in our own communities and with the people we interact with on a daily basis- and some of them are like us and some of them aren’t. But the best way to live out the gospel calling of Christ is to be nice to people. Create a spirit of peace and care in your communities wherever you go, with whomever you encounter.